Georgiann Baldino has been publishing fiction and nonfiction since 2004, primarily concerning the American Civil War era. 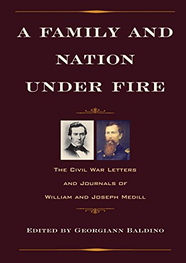 Her most recent book, A Family and Nation Under Fire, from Kent State University Press is a collection of previously unpublished journals and correspondence between Maj. William Medill, 8th Illinois Cavalry, and older brother Joseph, one of the influential owners of the Chicago Tribune. Beginning with the Three-Fifths Compromise in the U.S. Constitution, United States history is filled with “compromises” intended to preserve a rough balance of power between slave-holding and free states. The Three-Fifths Compromise was followed by the Missouri Compromise of 1820 and the Compromise of 1850. These negotiations helped America delay war, but after the Kansas-Nebraska Act of 1854, further concessions meant not only preserving but expanding slavery. The election of Abraham Lincoln outraged many in the South. South Carolina Governor Francis Pickens declaredprior to the Civil Warhe “would be willing to cover the state with ruin, conflagration and blood rather than submit” to abolition. (1) After decades of compromise on the issue of slavery, South Carolina became the first state to secede. Ultimately Governor Pickens reached his goal, but before peace was restored, conflagration and blood truly covered South Carolina. Lincoln’s campaign and election prompted a different response from activists like Joseph Medill, co-owner and editor of the Chicago Tribune. Medill was motivated by a desire to preserve the Union and emancipate slaves, and he felt a good newspaper must report stories in ways that advanced society. To him that meant abolishing slavery. Joseph became a key player in a new generation of abolitionist leadership. Joseph Medill and his partner, Dr. Charles Ray, used the pages of the Tribune to support the Lincoln administration and rally the public to the cause of emancipation. Joseph urged the swift organization of black regiments and broadcast the goals for the Union League of America (U.L.A.,) a group established to promote loyalty to the Union. Joseph played a prominent role in Union League programs. (4) The U.L.A. supported organizations such as the United States Sanitary Commission and provided funding and organizational support to the Republican Party. Joseph’s early public calls for war turned to personal anxiety and grief when two of his younger brothers became casualties of war. Yet, he continued to support a war of liberation and pursue principles of freedom and self-government. Joseph provides a poignant example of moral imperative informing political activism. People didn’t grasp the danger of a house divided then, and many fail to grasp it now, but history repeats itself in elusive, yet profound, ways. Today, the ugly specter of divided parties returns. No matter which party we align with, President Trump’s ability to divide us and willingness to condone violence should alarm us all. From the beginning of his campaign, Donald Trump used rhetoric to incite supporters, using baseless slurs to disparage immigrants (6) and political opponents. During the presidential campaign in March 2016, it seemed unlikely that Trump had enough votes at the Republican National convention to secure his nomination. If that happened, Trump warned during an interview with CNN, “I think you would have riots.” (7) When President Trump wages verbal war with the intelligence community and independent sources of investigation, he provokes division that threaten to become an “irrepressible conflict,” echoing the pre-Civil-War rancor. If Americans don’t reject politicians who divide us, condone violence, label a group of people as criminal, and another group enemies of the people, we do so at our own peril. Once again we face dilemmas that require as much of us as any time in the nation’s past. Modern Americans tend to take our stable democracy for granted, but Mr. Lincoln realized the freedoms gained in the Revolution could be lost. He enlisted newsmen like Joseph Medill to champion justice and liberty. 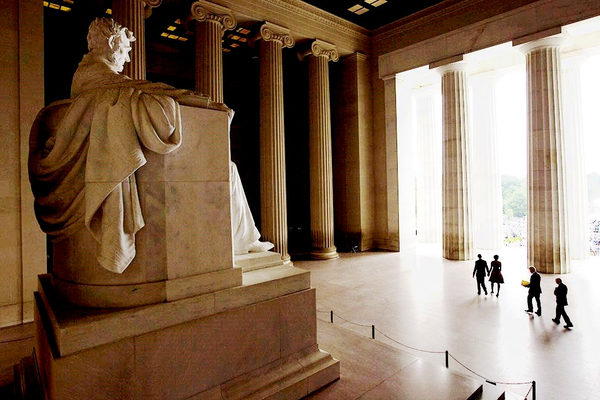 Lincoln understood that involved citizens preserve the union, and he taught a vital lesson that only when human rights are respected is democracy worth preserving. (1) Orville Vernon Burton, Age of Lincoln, (New York : Hill and Wang, 2007)118. (2) Longtime Lincoln friend and supporter Norman Judd did not receive a Cabinet post but was named Minister to Prussia. (3) Georgiann Baldino, Editor, A Family and Nation Under Fire, (Kent: Kent State University Press, 2018) 25. (4) Robert McCormick’s papers in the McCormick Research Center at the First Division Museum, Medill Family Correspondence. (5) Speech of the Hon. Robert T. Lincoln made at the Celebration of the Thirty-eighth Anniversary of the Lincoln-Douglas Debate, Galesburg, Ill., October 7, 1858(Hancock NY: Herald Print, 1921) 2.